Hawaii 2013 TravelsOur 4th Hawaiian Vacation with visits to the San Francisco Bay area, Kauai, Maui and The Big Island of Hawaii, May 5th to May 23rd. Hawaii 2011 TravelsOur Third trip to Hawaii for our 15th Wedding Anniversary, May 5th through May 21st, 2011. Visits to The SF Bay and Montery Bay areas of CA and Oahu and the Big Island of Hawaii. Hawaii 2009 TravelsPhotos from oour second Hawaii trip, May 1st through May 16th, 2009. Visits to the SF Bay Area, The Garden Isle of Kauai and the Island of Oahu. Our final two night layover in the San Francisco Bay area, including a visit to the San Jose Museom of Technology and just bumming around the area along with sights from our flight home. May 14th to 16th. Photos from our Labor Day Weekend 2008 Amtrak Train Trip to Washington, DC with Julie, Nicole and Natalie Todd, August 30th to September 3rd. Our Drive down the upper half of Skyline Drive in the Shenandoah National Park, May 8th. Photos of our tour of Luray Caverns, Luray, Virginia, the morning of May 9th. 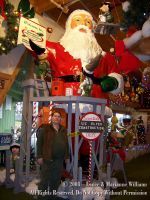 Our tour of "Celebration on Parade", a musem of parade floats from the Rose Bowl and other famous parades. Afternoon of May 9th. PIctures from the Memories Theatre show "Elvis & Friends" in Pigeon Forge, TN, Evening of May 10th. The Elvis impersonator is fantastic, we saw him on our last visit in 2001. Our tour of the Largest Private Residence in the United States, Biltmore Estate, in Asheville, North Carolina, May 13th and the "Behind the Scenes" Tour on the morning of May 14th. Five nights on the Island of O'ahu, staying at Turtle Bay Resort on the North Shore on August 10th to 14th. Two nights on the Island of Kaua'i, the "Garden Isle" on August 15th & 16th. Includes pictures from our airplane flight overand around the island. Five nights on the Big Island of of Hawai'i from August 17th to 21st, staying at the Hilton Waikoloa Village on the South Kohala coast. Final 2 night layover in the San Francisco Bay area on our way home, August 22nd and 23rd.